E-learning promotes the use of structured learning materials which extend the book based metaphor of chapters, lists and diagrams using markup languages based on HyperText Markup Language (HTML). Educators working with eXtended Markup Language (XML) have a variety of XML based technologies to choose from: Moodle, Resource Definition Framework (RDF) and Web Ontology Language (OWL). Another option is to use XML to generate web resources from a relational database, such as MySQL, or with a knowledge database, such as Prolog. This chapter looks at how these three technologies can interchange information with the help of new intelligent resources such as the OpenMind project that are beginning to model the world around us. Advances in these areas pave the way for more automatic acquisition of knowledge from existing texts using tools such as MontyLingua to provide a basic semantic understanding of the material and promote interoperability. Examples of the technologies are used to illustrate the benefits of structuring new learning materials, and options for integrating heritage materials are examined. Learning materials are lovingly crafted to cover a syllabus and provide intellectual stimulus and entertainment during the learning process. From the earliest days of sticks and a flattish area of mud, through the abacus, paper and the invention of the printing press, it has been important to find a way of sharing learning materials as widely as possible. The advent of the personal computer in the 1980s finally made an electronic means of sharing a possibility, brought closer by the Internet's rise to prominence in the 1990s after decades of work to make computers and networks talk to each other without calling in a team of programmers. Now learning materials are shared across continents as well as counties, often for free, as electronic e-tutors. However, this sharing has happened largely at the level of the printed page, based on the idiom of the sharing of books. Only in the last few years has the markup language behind web sites developed enough to allow true sharing at the ideas level to become a possibility. Systems like FIRE (2006) from the LIFE project funded by the European Commission (Education and Culture) provide a means of browsing learning objects from multiple sources and show great promise for systems being developed today for large organisations. However, as studies such as Mayes and de Frietas (2004) show, much of the material from currently available e-tutors is not in this form. The simplest web pages use Hyer Text Markup Language (HTML) tags such as <font> to indicate how to draw the page on the screen. More advanced pages structure the information in the page using eXtended Markup Language (XML). 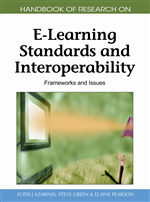 The Open Source Learning and Development Environment (LDE) Moodle, described in Cole and Foster (2007), is an example of tagged learning materials that provide a means for teachers themselves to develop learning resources. A strategy for interoperability must include tactics to deal with legacy systems and teacher-created materials to avoid valuable material being left behind. All tag-based technologies can search the knowledge content for concepts. HTML and XML technologies achieve this through the tag metadata, whilst a relational database such as MySQL or a knowledge base such as Prolog can also use relationships between the metadata to process existing data and create new data derived from it. A knowledge base has the additional capacity to reason about the content from these relationships, often referred to as a semantic network. Both the relational model and the semantic network are built from the terms used as the metadata for database fields or tagged documents. In many current systems these are hand crafted, but in both fields there is a motivation for partially automating the process to provide a first draft that a human expert can then edit appropriately. This chapter considers what is possible now when I write new learning materials for our reasoning e-tutor in an area where other e-tutors exist. The Interactive Verilog Compiler (IVC) system teaches how to programming the sequence of lights on a traffic light in the United Kingdom using the hardware definition language Verilog, a C-like language used in chip design. The tutor uses the network to generate answers to free text questions as well as for a framework for the learning materials. A real bottleneck in adapting IVC to work on other domains is the editing of new materials, which leads us to investigate interoperability. In the following example, please imagine I have two colleagues, Alice and Bob. Bob is teaching young children about road safety using Moodle documents tagged in XML. The tags are referred to as metadata. Alice works with college students in town planning and associated industries and is using a MySQL database of road furniture to support and record metadata about each of her lessons, which are stored in XML documents. Ideally, I could use content and metadata that Alice and Bob have already created in their relational and XML systems. One approach would be for me to sit down and read the definitions and use my expertise to blend the three models together. This is time-consuming for more than the smallest subject area, but unfortunately I am not at the stage of interoperability that can directly translate from one format to another, especially as my materials are aimed at different age groups. XML Schema Definition (XSD): A text document that defines what tags a piece of text must use and in what order to be valid. An XSD understands more about whether the information should be numeric or text based. It allows definitions such as (country code, district code, local code) to define an international telephone number to be defined once and then referred to in many text documents. Anaphoric reference: techniques to establish which noun a pronoun refers to, or how a complex sentence structure indicates location and time ordering, for example, in the sentence The man saw the boy in the park with his telescope. Attribute: in data modelling a piece of information often part of a real world object or an abstract concept, for example, colour is an attribute of the entity rainbow. Entity: in data modeling a noun used to describe a real world object or an abstract concept, for example, a rainbow. Semantic Network: A term used in computer language processing and in RF and OWL to refer to concepts linked by relationships. Memory maps are an informal example of a semantic network. Web Ontology Language (OWL): extends the capabilities of RDF by defining a language to process and reason about the data rather than use a computer database or a knowledge base. Synonym: Another word representing the same concept, for example, sunlight and sunshine, but not sheep and ewe, as an ewe is a particular female kind of sheep, hence a taxonomy relationship. Markup Language: text annotated with directions to a computer on how to display or interpret the text. The name is thought to originate from the newspaper and book publishing term for the notations that book publishers use to direct human printers to get the required effect such as font size and indentation on the printed page. Document Template Definition (DTD): A text document that defines what tags a piece of text must use and in what order to be valid. A DTD acts like a list of boxes to complete on an official form – if a piece of information is missing, then the form is not complete. Resource Definition Framework (RDF): Extends the capabilities of XML to model data to allow a web page to store and retrieve information rather than go to a database to find it. eXtended Markup Language (XML): Extends HTML by giving text a particular structure that can be checked by a computer program if a DTD or XSD is provided. Coverage: is a quality measure of the percentage of the material that any automatic processing can recognize.Database a computer program which stores and retrieves information, such as Microsoft Access or MySQL. Databases have been used since the 1950s for administrative tasks such as banking and for scientific data such as astronomy. A database organizes information in an electronic equivalent to an official form, and makes sure that this structure is used to keep the data valid.